Just Say "NO" to that Dirty Deck! Estimates are Free! | Deckshield International Inc.
Just Say "NO" to that Dirty Deck! Estimates are Free! Deckshield inspects every deck prior to providing an estimate. Estimates are free and nobody needs to be home at the time we come out. If you prefer to be home for the estimate, that's terrific! Just let us know the most convenient time to come by. 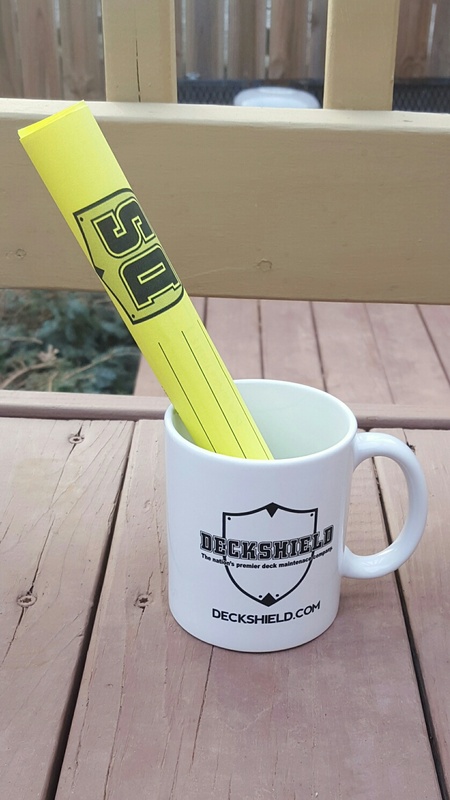 Get an Estimate for your Deckshield Service and receive a FREE DECKSHIELD MUG! That's right, you don't need to purchase our service to get the mug... just our way of saying "Thank You" for giving us the opportunity to work for you! You will find the estimate inside of the Mug on your doorstep... like a little present! Maybe you will be able to enjoy a hot cup of coffee on your new looking deck when we are done! usually within 24 hours, and leave the estimate for you. Voice Mail, please leave the information on the system and we will get an estimate to you as quickly as possible.